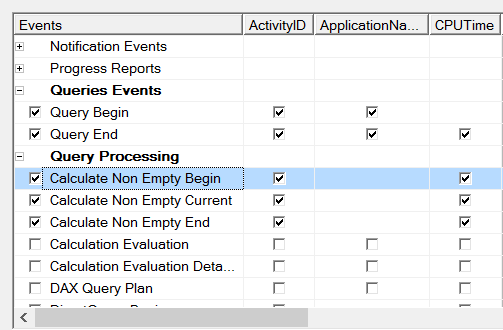 In part 1 of this series I introduced all of the different types of non empty filtering that can occur in Analysis Services and MDX. In this post I’ll show you how you can monitor each of these types of non empty filtering using Profiler using the queries from part 1 as examples. 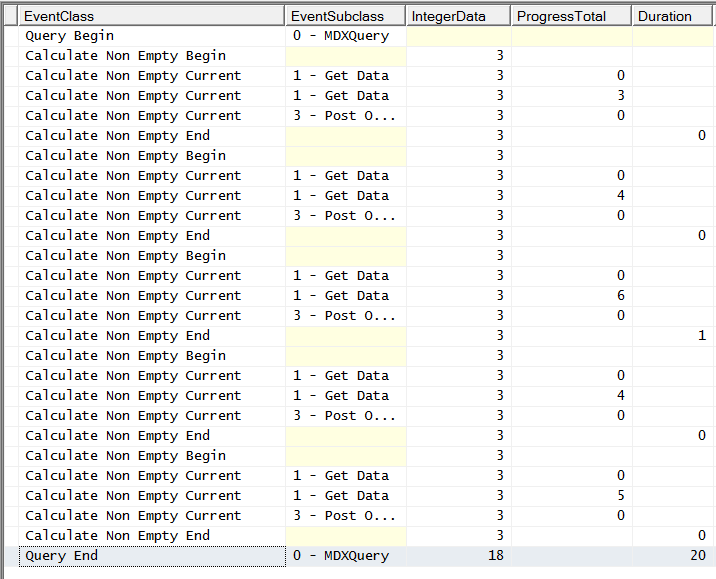 I’ve also included the Query Begin/End events in my traces just to show when query execution starts and finishes. All the queries in this post will be run on a warm cache; although the values used for non empty filtering can be cached, SSAS can’t cache the output of a non empty filter (unless you do something like this) so for our purposes whether the cache is warm or cold is irrelevant. 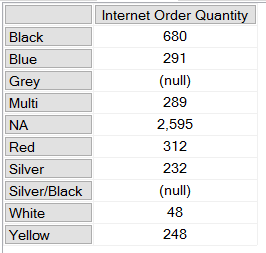 The Duration column tells us how long, in ms, both the query took to run (on the Query End line) and the non empty filter took to evaluate (on the Calculate Non Empty End line). 2 – EXISTING operations using a fast algorithm. This is a bit misleading though, because due to an internal bug this event will not fire for most uses of the EXISTING statement but will fire for some operations related to regular autoexists. The ProgressTotal column for the Calculate Non Empty Current (as with the Serialize Results Current event) and EventSubclass 1 should return the number of tuples evaluated for the non empty filter. If the number of tuples is greater than 1000 you’ll see multiple events, one for each 1000 tuples, with the last event showing the overall total. Unfortunately there’s a bug here that means it returns one less than the actual number of tuples evaluated. 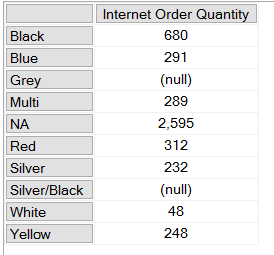 What’s more, in most cases, the non empty filter operations in the SSAS engine are difficult to match to whatever’s going on in the query, so it’s only really useful as a relative measure of how expensive the operation is. Putting this all together, for this query we can see that there was one non empty filter operation, it was using the fast NON EMPTY algorithm, the ProgressTotal column shows 3 tuples were returned (ie the three Categories on rows) and it took 1ms. Even with what looks like a single autoexists operation there are three sets of Non Empty events here, two of which have IntegerData 3 (for autoexists) and one with IntegerData 2 (for EXISTING which, as noted above, is to be expected here with autoexists). The ProgressTotal column returns 26 for a query that returns 24 rows which I guess is near enough correct to be useful. Weirdly enough, the presence of a WHERE clause or a subselect in a query also triggers Non Empty Begin/End events [Subselects are something that a lot of SSAS developers get confused by, especially when it comes to the differences between a subselect and the WHERE clause – I recommend watching this short video if you’re unsure of what they do]. Probably the only value in knowing that this happens is that you can ignore it when you see it. Again, if you have a subselect in your query (they are very common in MDX generated by SSRS and Excel) you should ignore this activity. 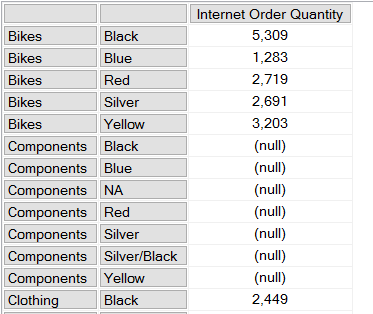 In both cases you’ll note that the IntegerData column shows 3 for autoexists and ProgressTotal shows 0.